Last Sunday we were invited to exhibit at a new wedding venue in the Annapolis area called The Byzantium hosted by Val from VME Events. Situated on the same property as the Sts. Constantine and Helen Greek Orthodox Church on Riva Road, this awesome new event space is perfect for weddings and private events, and can accommodate up to 600 people. What? For real, they have 2 separated areas (perfect for cocktail hour in one, dinner in the other) and then a huge open space (like a gym) that can accommodate up to 600 people depending on your layout and what type of event you’re having. Anyway, Kyle Bergner Photography was there to capture photos of the showcase and that she did. 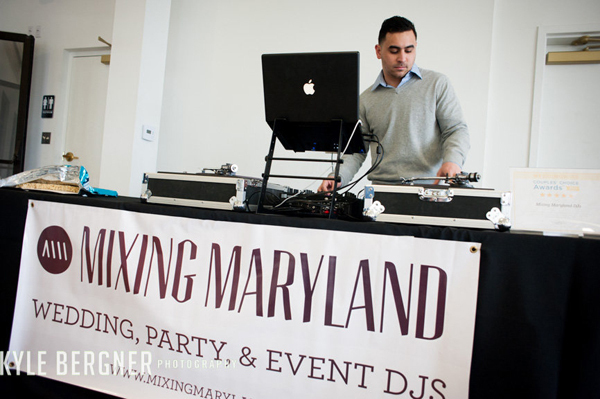 Here’s one of Kyle (the DJ, not the photographer) DJing at the event.